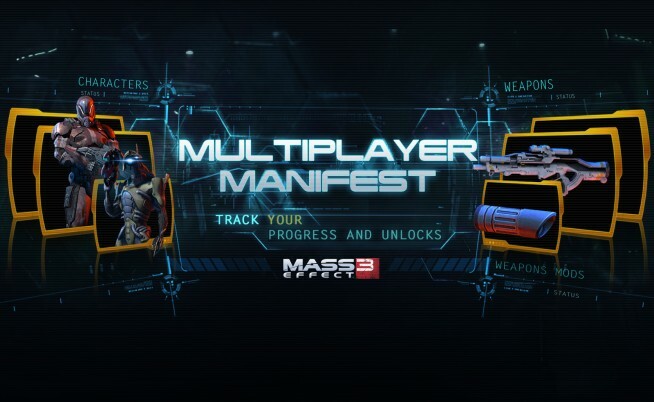 BioWare is taking Mass Effect 3’s multiplayer to the next level with their brand new ME3 Multiplayer Manifest. With game enhancing services like Call of Duty’s Elite, Battlefield 3’s Battlelog, and Ghost Recon Future Soldier’s Ghost Recon Network slapped on to many of today’s top AAA shooters, it’s easy for other titles to get lost in the crowd without their own way to keep players hooked 24/7 across multiple devices to their own multiplayer experience. BioWare seems to be taking this lesson to heart. Starting now, ME3 players can log into the BioWare Social Network using their EA Origin account to view their own ME3 Multiplayer Manifest. This Manifest lets players inspect multiplayer avatars without having to boot up the game itself. Additionally, “players will be able to view which characters, weapons, mods and consumables they’ve unlocked in MP, and what’s more, you’re able to compare your stats with your friends,” according to the BioWare Blog. So far, things look like they’re off to a great start. However, BioWare has stated that “new features for the manifest are in the works and will be added soon.” So, make sure to keep checking back to see what updates BioWare has in store for ME3 multiplayer fans. Give it a spin and leave your thoughts in the comments below! Also, don’t forget about this weekend’s community challenge, Operation: Exorcist.